The German aquarium magazine “Amazonas” (its Russian version) organized an interview with Prof. Dr. Wim Crusio, the author of the Anubias revision. The magazine’s redaction kindly granted us its permission to publish the interview. We express our thanks to the Russian “Amazonas”. “Amazonas”: After having read your Anubias genus revision (1979) i got an impression that in the first half of the last century botanists were very interested in these plants. In other words, there were collected plant samples, made up species descriptions, reconsidered previous descriptions. What is going on in this field now? Is "classical" botany out of fashion nowadays? Were there new Anubias species described in the scientific literature after release of your revision? Wim Crusio: No new species of Anubias have been described since my revision. I am not sure whether classical botany is out of fashion nowadays. I think that several factors play a role. We have nowadays much more collections available (and all of those are more easily accessible) than the late 19th/early 20th century botanists. So when we get a new collection, it is often immediately clear that it falls within the range of variation of an existing species. So whereas such a new collection might have been described as a new species 100 years ago, this is not the case now. Also, modern taxonomists often have a much broader species concept ("lumpers") than botanists 100 years ago ("splitters"). “Amazonas”: As I understand from your revision, Anubias leaves form is not of big taxonomic importance in the process of species detection. Here only position and texture of thecae in the synandrium play a big role. Meanwhile, according to this very difference in leaf-blade forms you have singled out 5 varieties of A. barteri. What is the reason, that prevented A. auriculata and A. Haullevilleana (described by Engler and Wildeman) from getting the status of varieties as a part of A. hastifolia species? Wim Crusio: That's a good question! The only reason why I chose to distinguish 5 varieties in A. barteri and not in A. hastifolia (or any of the other species, for that matter) was purely pragmatic. Many different clones of A. barteri variants are cultivated by aquarists and I realized that if I would all give them the same name, "A. barteri", then this would be very inconvenient for these people. In other words, I think there was a need to distinguish more types within that species. As the other species are cultivated much less often, I didn't feel that it was necessary to recognize any varieties there. “Amazonas”: Anubias plants have been used as plants for aquarium for a long time and this fact makes them very popular. What made you study exactly Anubia at the beginning of your academic career? Do you have now or may be have you ever had an aquarium or a paludarium at home? Wim Crusio: I started keeping aquariums when I was 12 or 13 years old and started writing about fish and plants for our local aquarium society shortly thereafter. In fact, my first plant article must have been on an Anubias! I didn't recognize it at the time and identified it using drawings in the book of de Wit, so I called it (incorrectly) Lagenandra lancifolia. Because of the aquarium hobby, I decided to study biology at the University of Nijmegen. As part of my "master's degree", I had to do three research projects, two of 6-months and one of 12. Having been interested in systematic biology for a while, I contacted Prof. de Wit in Wageningen and asked whether I could come there for one of my 6-month projects. Originally he proposed that I would study Cabomba, but the rest of the laboratory objected to that (because officially, the lab was specialized on African botany). So de Wit then proposed Mayaca, but it turned out that it had already been revised not too long before. He then called Josef Bogner from Munich, who suggested Anubias. It was a bigger genus than de Wit liked (given that I had only half a year), but we went ahead anyway and in the end I prepared my revision in about 7 months. After that, I went on to study mouse behavior genetics and did my PhD in that field. During that time, I had no aquarium at home any more, but kept Anubias, Cryptocoryne, and Lagenandra species in the greenhouse of the botanical garden in Nijmegen. I did some experimental inter-species crosses, but unfortunately never had the chance to continue that work (which I included in the German translation of my Anubias revision). After my PhD I left the Netherlands, first for Heidelberg, later for Paris and there I did not have access to a green house any more and my mouse work started to take too much of my time, so I haven't been actively involved in aquariums or aquatic plants since the mid-1980s. But once I start thinking about retirement, I'll certainly start keeping aquariums (and aquatic plants!) again. “Amazonas”: It is well known, that Anubias species are easy to cross with each other. Particularly, many hybrids of these plants were artificially breed. Surely we can observe such processes in nature. Taking into consideration relatively conditional character of the term "species" in biology and revision as only a way of species regulation with regard for alliances, it is still interesting, how does your revision consider the existence of possible natural Anubias hybrids? What do you think of taking into account genetic features in modern revisions (for instance, in Echinodorus revision by Lehtonen)? Wim Crusio: In 1977 (when I did the Anubias revision), we did not yet have all the techniques available that we have now. It would certainly be interesting to look at these things! Whether many natural hybrids occur, I don't know. Remember that several species have non-overlapping distributions (A. afzelii, for example). “Amazonas”: What European Web-sites that provide enough information about Anubia would you recommend? “Amazonas”: Do you know any hobbyists who has the most complete collection of Anubia? If yes, could you tell how we can get in touch with them in order to share information? Wim Crusio: I must admit to being out of touch with most of the aquatic plant world. I would guess that Josef Bogner in Munich still has a good collection, or else would know who has. “Amazonas”: In this connection I’d like to ask if you have Anubias hastifolia Engl in your collection? In case you have it, please, show us the leaves and if possible the inflorescence of this plant. Wim Crusio: Yes, I used to have it (not any more...) I have slides from the plant (including inflorescence), but no slide scanner. If I remember correctly, there were photos in the German version of my revision. “Amazonas”: Please, clear up the situation involving Anubias pynaertii. When working at your revision you dealt with many samples of this genus, but at that time the living plants were grown only in your laboratory in Wageningen. A. pynaetrii is still a big rarity, for example, it is not cultivated in Russia at all. 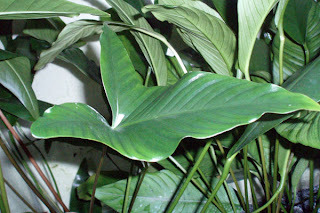 One can buy a plant under the name A. pynaertii with such kind of leaf form (see the picture below). What are in your opinion the reasons for this genus being so rare? Wim Crusio: I am not sure that the leaf below belongs to A. pynaertii, but it could be. I would need an inflorescence to be certain. Why it is so rare in culture I do not know, it is not more difficult to cultivate than the other species. This bulletin presents highlights of the Russian Anubias Forum, which exists since 2008. This forum is devoted to the growing of Anubias-plants, their systematization, etc. The Russian version of the forum is available at the following Web site. Die deutschsprachige Version des Bulletins befindet sich hier. We address to Anubia-fanciers from all over the world! Everyone who is interested can join our team and send us his own notice about Anubias! If you have a question or an interesting observation concerning these plants, write us (korall-magazine at mail.ru OR anubias at tropica.ru)! We hope other aquarians will read it with great interest! Let's do it together! German magazine Aqua Planta - a must for every fancier of planted tank!